The basic blueprint of American high schools hasn’t changed in a century, and we are paying a heavy price. Anonymous, enormous, and resistant to change, huge American high schools are incapable of educating all children to high levels today, as dropout rates and remedial courses in college make increasingly clear. 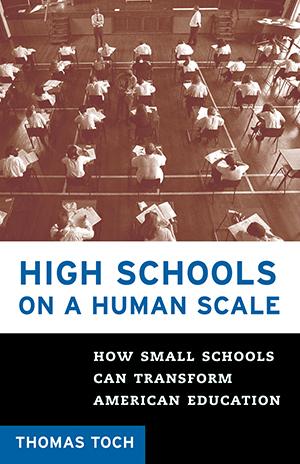 High Schools on a Human Scale shows the huge power of small schools, perhaps the nation’s fastest- growing reform idea. Tom Toch takes us inside four very different small schools around the country-from an entrepreneur’s high-tech charter school in San Diego to a school formed out the of the breakup of a huge public high school in Manhattan. All are small enough so that every student is known well by adults, and the results are remarkable. Together they show the proven virtues of small schools-safety, community, and high achievement. This book is sponsored in part by the Bill and Melinda Gates Foundation’s $40 million effort to support small schools nationwide.